State TYPE of Borden Floor Grating that meets your needs. 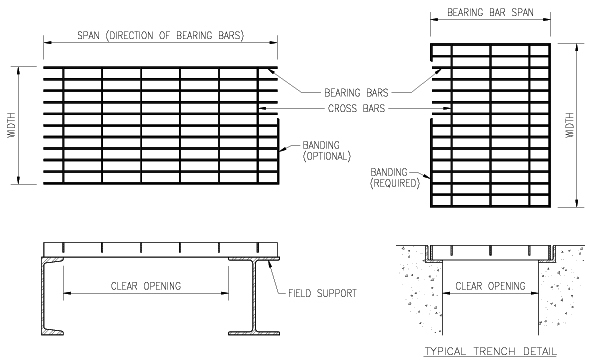 State direction of bearing bars (span) if no drawings are available. State if clearance is to be allowed (if only areas are given). Specify "Serrated Surface" (if required). State finish required - painted or galvanized. Provide shipping and marking instructions. Give Type (letter), Size (No. 1 to 12 for Standard Gratings or 8 to 22 for Heavy Duty Gratings). Add "as made by Borden Metal Products (Canada) Ltd.". If you submit floor plans or state area openings, it is not necessary to select sizes of grating panels. Our Engineering Department will lay out your complete grating floor from your plan and sketches. Erection diagrams are furnished by Borden when necessary. Gratings can be furnished with fasteners where required at additional cost. Our Engineering Department will welcome inquiries on any grating problem you may have. Simply provide the details of the spans involved and the type of load the gratings are required to handle. Every effort will be made to provide you with a satisfactory answer to the problem as promptly as possible.